Grand Prix at Silverwood with Godiva!! We were very happy to welcome Herr Riegler back for another clinic with Janna's training horses and students! 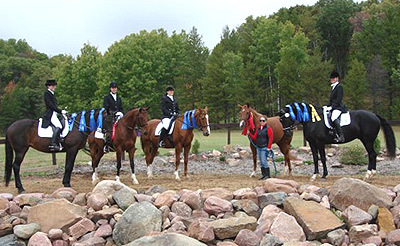 Many of the same horses and riders from the previous year took part and were able to build on what they had learned. Photos coming soon . . .
Leaving the horses in Betsy's trustworthy care for a whole month, Janna took the opportunity to go overseas and train with some classical masters on their own horses. The first stop was Vienna, to see old friends and catch up with the latest at Herr Riegler's barn. The recent release of his book, "Beruf Oberbereiter" ("Profession, Head Rider") was the big news -- Janna got a copy of the book in German from the Rieglers, although it will be coming out in English at some point for those who can wait! 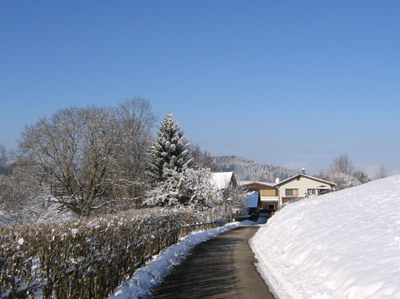 At Herr Riegler's recommendation, the bulk of the trip was actually spent in Switzerland training with Christine Stückelberger and Georg Wahl. Herr Wahl was one of Herr Riegler's primary teachers at the Spanish Riding School, and also coached his life partner, Frau Stückelberger, through six Olympics, as well as an individual gold medal on the legendary Granat. 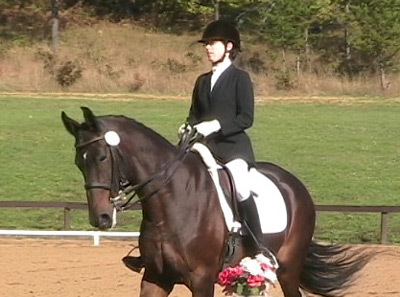 Their facility is now primarily used for Frau Stückelberger's own training horses, some of whom she is preparing for competition and some she is preparing for sale. 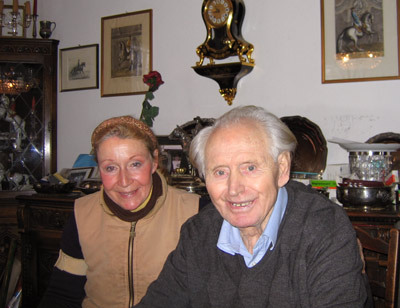 During her stay in Switzerland, Janna had the opportunity to ride most of Frau Stuckelberger's horses with daily coaching from Frau Stückelberger and occasionally Herr Wahl (now over 90, he is not as active as he used to be, though still an amazing teacher). Many of her horses are young stallions with top bloodlines coming up the ranks, and have incredible movement! It was really a treat for Janna to be able to ride these horses and absorb as much as she could about how to ride them in a relatively short amount of time. Janna is further honored to be representing the sales horses in the USA - check out the International Sales page for more information. Frau Stückelberger and Herr Wahl are some of the few trainers around who still teach a very pure, classical style of riding. Emphasis was always on correct use of the seat and on riding with a soft, light hand. Whether on a green baby or a seasoned grand prix horse, Janna was held to a strict standard of minimal aids. Lessons on the longe were interspersed over the weeks to reinforce correct seat and position. Working with these horses and masters was truely inspirational, and Janna hopes to be able to bring a refined technique back to her training horses and students back home, though the quest for improvement is never-ending! 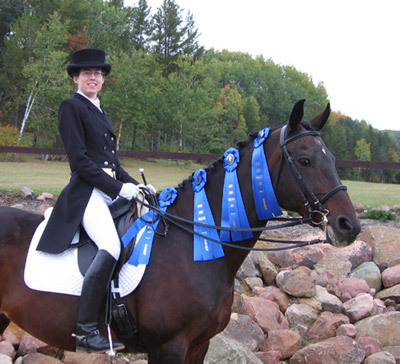 Chinnock Farm hosted the annual Western Wisconsin Nutrition seminar this year, with Godiva and Janna providing a lecture and demonstration on dressage. They demonstrated the progression of training from the basics up through grand prix, explaining the principles of classical dressage, and fielding questions from the audience. There was also a lecture on equine nutrition sponsored by Purina, for which horses at Chinnock served as models for proper weight and body condition (although it was suggested that a few of them could stand to shed a few pounds!). 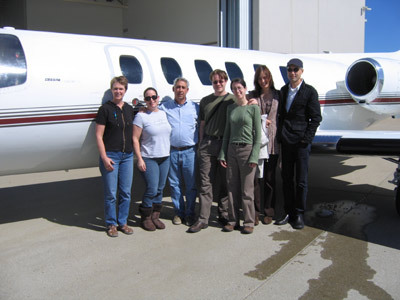 A group of Chinnock riders flew down to the World Equestrian Games in Lexington, Kentucky with the adept assistance of Jeanette's husband Joe, whose expert piloting skills were among the major highlights of the weekend! 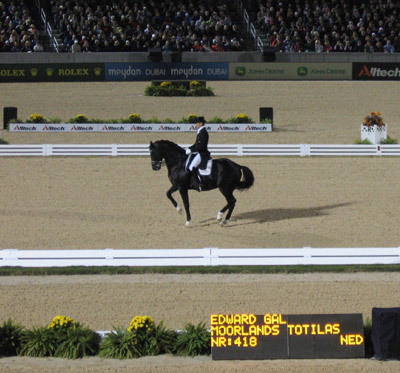 We also got to see the world-famous Totilas win the Grand Prix Kur in his record-smashing style, as well as many other fabulous horses and riders, not only in dressage, but also the eventing world. This weekend we were honored by a visit from Janna's Viennese trainer, Hans Riegler, chief rider at the Spanish Riding School. He came for three days to work with Janna and her students at Chinnock Farm. 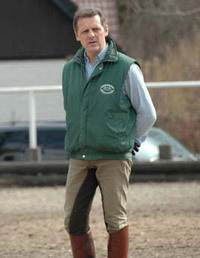 Having recently retired from the SRS, Herr Riegler has been busy giving clinics and lectures, in addition to continuing to run his own training barn outside of Vienna, and publishing a DVD on "The Pliable Seat," available in English and German. Riders and a small group of auditors were able to learn first hand about what goes into the classical training of horse and rider. Some of Janna's students were able to benefit from seat work on the longe line, and even those who did not work on the longe did extensive work on improving their seat to get a better swing from their horses' backs. Janna herself rode four horses each day of different levels, working on elements from training level up through grand prix. Herr Riegler and Janna also did in-hand work with a couple of the horses, demonstrating how the piaffe training could help improve the horses' collection, balance, and swing. A relentless perfectionist, Herr Riegler showed all of us the importance of taking responsibility as riders for our horses' way of going. We were thrilled to be able to work with a master at this level, and hopeful that we will have the opportunity to do so again soon. Our first show of the season had its predictable share of rain (and even a little snow! ), but not enough to keep us out of the beautiful outdoors at Otter Creek. Godiva and Janna made their debut at FEI Intermediare I with a 61.6% score on the first day, and victories on both days! At 22, Godiva still seems eager to meet the challenges of the upper levels. The other two horses showing from Chinnock were Cosmo and Haakon, who had come a couple weekends before, along with Juliet and Richard riding their horses Noah and Darwin, to get acclimated at the spring schooling show. The drop in temperatures made the young horses a little frisky at the May Flower, but both were well behaved and did well at first level, with Janna riding Cosmo and Marcia riding Haakon. Check out more pictures from the horse show in the show photo gallery and video gallery. 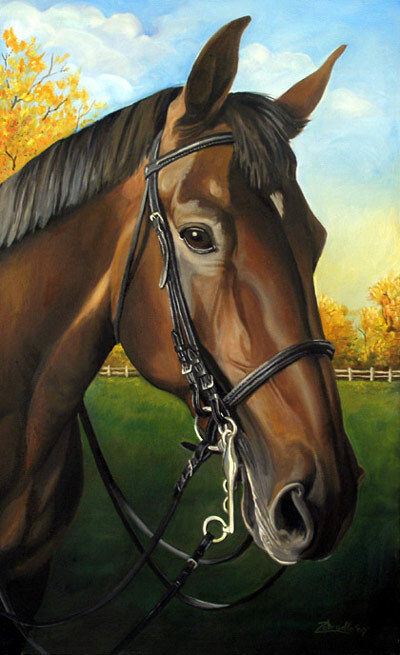 Local artist, Gary Zahradka, recently completed a beautiful oil portrait of Godiva. His detailed portraiture captured her expression with remarkable clarity! For human, animal, and representational portraiture, his work comes very highly recommended -- check out the Zahradka Art and Illustration website to see more of his artwork. Yet again, we had a fun and successful fall festival! Godiva helped Janna earn her remaining silver medal scores and FEI high point award at the show. Janna's student Sally also earned the overall high point award for scoring 70% aboard Vegas, showing 1st and 2nd level. With six horses from Chinnock at the show, finishing first or second in all of their classes, we had much to be proud of. The horses had a fun time being there as a group, and so did we, celebrating Juliet's birthday and enjoying wine and cake the first night! (The horses had sugar and apples . . .) Despite a bit of rain and chilly temperatures, the show atmosphere was warm and congenial, thanks to the Warners and the show staff. Check out more pictures from the horse show in the show photo gallery and video gallery. 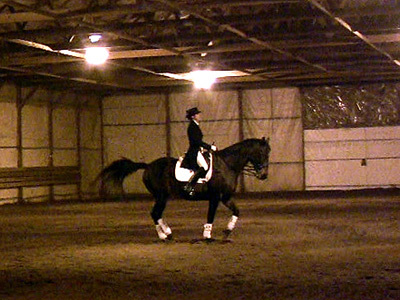 Godiva and Janna showed FEI Prix St. George at the beautiful Otter Creek facility, and earned scores of 62% and 65.8%. 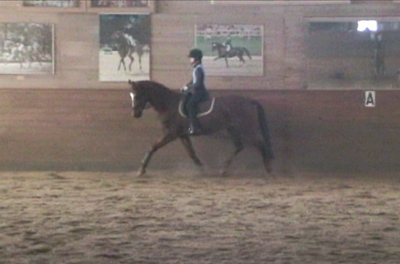 Not bad for a 20 year old (horse, that is . . .)! It was a fabulous weekend -- thanks to everyone for helping out! Check out more pictures from the horse show in the show photo gallery and video gallery.